Watermelon farming in Nigeria is one of the lucrative agribusinesses in Nigeria, which is gradually taking over from crude oil because of its high demands. Nigeria as a nation is blessed with varieties of resources ranging from a vast richness of the land, natural resources, and climatic variations that enable it to grow different varieties of food and cash crops in its agricultural sector. Nigeria has the most engage Agricultural sector in Africa, the local agricultural industry employs up to 70% of the local workforce and contributes about 40% of the country’s GDP. It is however noted that one of the agribusiness One of such agriculture that plays a vital role in our economic value in is Watermelon farming in Nigeria. Watermelon (Citrullus lanatus) may be a soft, long-season crop and member of the Cucurbitaceae family, which also include squash, pumpkin, cucumber, muskmelon and gourd. The origin of the species is traced back and said to be originated from the Kalahari Desert in Africa with evidence of early cultivation in Ancient Egypt. Up until today, the crop is grown in semi-desert districts of Africa as an important source of water during the dry season and its demand is very high which is very encouraging to farmers. The watermelon crops can be breed in any part of Nigeria with demand for it increasing on a daily basis as a result of its numerous health benefits. Aside from having cancer-combating enzymes, it contains 91% water, 6% sugar and is low in fat. A 100-gram quota conjointly provides thirty calories and vitamin C in considerable content at 100 per cent of the days worth. additionally, the crop’s pulp contains carotenoids, as well as lycopene. Watermelon farming business is one of the most lucrative agribusinesses to operate in Nigeria because of its high turnover of cultivation in a short time. It takes watermelon fruits eighty-five days (85) from the planting date to reach full maturity. This implies that it’s not seasonal, it can grow all year round, you can harvest three sets of watermelon fruits within a year to sell. It is one of the fastest selling agro-produce in the international market and locally as well. Watermelon is widely cultivated and consumed all over the globe. From the Experts point of view, if you start this watermelon farming business on a large scale, you are guaranteed huge returns on investment. Commercial watermelon farming in Nigeria or anywhere else in the world is very easy to start and cultivate as it does not involve much work and does not require much technical knowledge and expertise. If you are interested and own adequate land space, you are absolutely good to go. It has the capacity to make a farmer wealthy within the shortest possible time. If you are considering crops to cultivate and harvest within the shortest possible time like pepper, okra, cucumber etc. For quick cash don’t forget to put watermelon in your cart. It can be grown anywhere in Nigeria and can also be cultivated all year round. The sweetness and crispy nature make it a well-favoured fruit. Presently, watermelon is the third most cultivated crop in the world. Potatoes and tomatoes are the only two crops that have been harvested more them watermelon. The watermelon fruit is extremely nourishing. In addition, it is made up of water to keep the body hydrated. Due to its high nutritional content, it is endorsed by nutritionists to be taken always. However, over the years, watermelon has been known to have numerous health benefits aside from us knowing it as fruit. It has the tendency to prevent heart-related conditions and fixing metabolic deficiencies. Watermelon naturally has high demand in the marketplace which is why you should consider starting it today. Also, it is highly marketable and financially rewarding, and the start-up costs for this business is significantly low. Watermelon poise a much higher demand than cucumber which has made watermelon farming business in Nigeria more lucrative. Most manufacturers of fruit drinks make use of watermelon than any other fruits for their supplements during production. While practising watermelon farming business, one of the things you never worry about is the pest because watermelon is pest resistant. Your job is only to tender your crop to maturity. 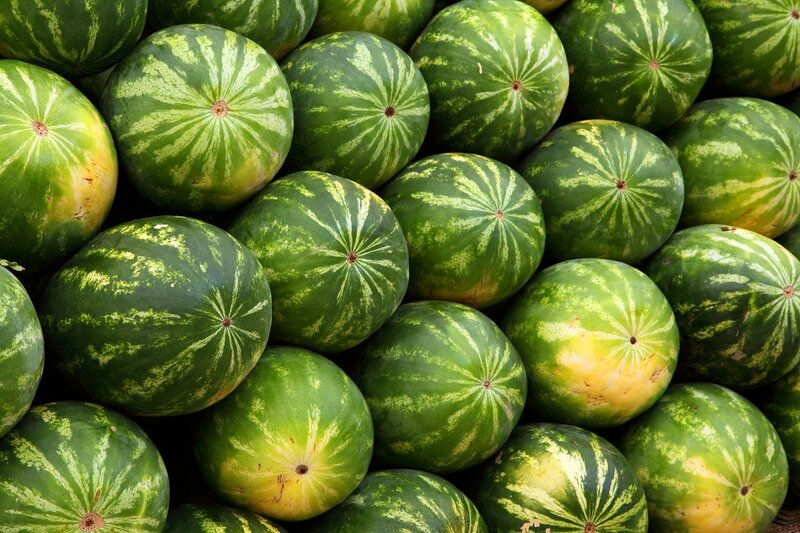 Watermelon farming business has a very high yield rate and can be done all year round with a repeat rate of three times yearly making you plenty of money and a high return rate on your investment. Starting a watermelon farming business in Nigeria is very easy and straightforward once you have the required startup capital. It’s not technical and not demanding. Watermelon is a highly desirable fruit because of it numerous nutrients such as potassium, magnesium, iron, amino acids, folic acid, as well as vitamins A, B6 and C.
It also contains lycopene, an antioxidant that prevents the skin from ultraviolet rays. Hence you can use watermelon to prevent sunburn. The lycopene content can also help reduce cancer risk and help prevent macular degeneration of the eye which is common among the elderly. Watermelon contains more than 90% of water which helps in digestion, heart problems and metabolic deficiencies and citrulline which can be given to athletes to help prevent muscle soreness. Citrulline also improves exercise performance and endurance. These are well-known nutrients that are of optimal benefit to the body and decrease the chances of the body coming under health threats. One key advantage is that it is easily accessible and very cheap. The Crimson Sweet Watermelon: this can be the foremost common styles of watermelon in Nigeria. It possesses a crimson flesh, with a singular chromatic stripy rind as well as a taste that is sweet-smelling. The black diamond: This specie features a dark skin, and a red flesh at intervals. its rind is bruise resistant rind with sweet tasting and features a luscious flesh. Charleston Grey: it’s red, fibreless flesh and a troublesome, medium-thick grey-green rind usually used for creating watermelon rind pickles. The Congo Watermelon: features a juicy red flesh and the content is high in sugar. The melon is rectangular and less green with chromatic stripes. Sugar Baby Watermelon: formally known as icebox as a result of their tiny size, since they’re sufficiently little to suit into a refrigerator. its flavour is red flesh and a light-weight green rind with dark stripes. Watermelon thrives quite well in hot and dry climate; this can be why it’s popularly cultivated within the Northern a part of the country. However, the perfect planting region isn’t essentially the North. It is often planted in any a part of the country. Usually, the beginning of the wet season or towards the tip of this season is that the ideal planting amount. the rationale for this can be as a result of the low moisture levels related to this era. In the Northern a part of Nigeria, this era is sometimes might for the first season or July for the late season. Generally, watermelon is often planted all year round within the North as long as there is adequate water through irrigation. In the Southern half, you’ll be able to plant in March that is the early planting season. you’ll be able to additionally plant within the mid-season that is either in late June or early July. Also, the perfect soil for planting is sandy or loamy soil. The farm ought to even have adequate exposure to daylight. If your soil isn’t extremely fertile, you’ll be able to plant the seed in plenty of compost. Additionally, watermelon needs a great deal of space. The plant could be a rambling plant and might smother something it comes to bear with. Though they do not climb on anything while growing, you’ll be able to train them on a robust trellis. This will increase their exposure to daylight and you’ll be able to additionally save a lot of space by applying this methodology. However, you would need to be experienced while constructing or putting in the trellis as a result of the fact that they are robust and be sturdy enough to support the burden of the developing fruit. A piece of land of about one or two plots is enough for a beginner to start; the land should be cleared of any grass and debris, burn the grasses and sticks or bury the grasses beneath the soil to serve as manure. The land should be ploughed before to planting; You can even make ridges or beds on it so as to create room for the movement of roots and enhanced penetration of water. However, Watermelons won’t grow well in wet soil, and the soil should also have a good amount of organic matter in it, particularly manure, as these will offer the plants the nutrients they need. You can plant the same day of tilling. It’s being determined that planting this manner is best than waiting until the day after. The type of seeds you plant can have an effect on the output. that is, it’ll verify the standard of fruits that may be cultivated. a decent choice is to induce them from the International Institute for Tropical Agriculture (IITA). you’ll be able to additionally savvy from another farm or bought directly from the market. thus ensure you discover the best specie and study its method of cultivation. Watermelon seeds are often planted on the flat land or on ridges. If the soil is clay, planting on a ridge or bed is usually recommended. On the opposite hand, you’ll be able to plant on a flat land if the soil is loamy. beneath a soil temperature of a minimum of 70°F and also a PH concentration between 6 and 8. This may avoid poor germination. The planting hole ought to be about 30 cm dip and they will be spaced at 6 feet by 6 feet apart to avoid competition. Generally, the method of planting also depends on the variety. If you are planting the Congo or Crimson Sweet variety, sow three to four seeds per row, and ensure the rows are ten feet apart or more from each other. Prior to planting, you’ll be able to assess the standard of the watermelon seeds by dipping them into a salt solution (3-5%). Those that ought to be planted should be without delay sink into the lower end of the bowl. also, the leatherlike seeds have to be compelled to be softened before they will be planted. When growing in marketable quantities you can plant on ridges. The soil used ought to be well drained because the watermelon plant doesn’t do well in the waterlogged environment. It is never recommended to grow your watermelon in the nursery. typically, the watermelon seed sprouts at intervals many days. Also, you can make the plants to be more immune to pest and diseases by drying the seeds beneath the sun for a week before planting. You should add humus to the soil before planting. This is better than organic manure because manure often affects the taste of the watermelon and it weakens the resistance of the plant to disease. You can also use inorganic fertilizers like phosphorus and potassium. Watermelons grow slowly throughout cold days. Hence, use hot caps or cold frames throughout cold days or nights. The watermelon is best planted at the start of the rainy season or when the rainy season is almost over. This will yield to a relatively low humidity, a condition essential for normal growth of the crop in southern Nigeria. In the northern part, early planting season is in May whereas late planting season is July. However, with useful irrigation in the north, it can be planted all year round, accounting for why it is often brought from the north. There are three planting seasons. Early planting is from March-May, mid planting season is in the Month of June /July, late planting is in August /September. However, with good irrigation watermelon can be planted all year round. Yield for a hectare of watermelon is around 2 tonnes, while that of late planting is 1 tonne. The number of fruits for early planting of watermelon is between 20 to 30 per stand whereas in late planting the fruit is between 5 -9 per stand. Though the soil is extremely fertile you still have to be diligent enough to add nutrient to it because watermelon needs some level of nutrients at every stage of germination. Scheduling of fertiliser application is set by the current soil condition and, subsequently, by the stage at which the watermelon plant is growing. Be it an emergent seedling or when it starts blooming, both stages have different nutritional needs including when fruit appears. Animals dung has been found to secure a well-favoured farm with a good harvest. When fertilising watermelon plants, the nitrogen-based fertiliser ought to be used first. Once the plant begins flowering, one ought to switch to feeding the watermelon a phosphorus and potassium-based fertiliser. Watermelons need ample potassium and phosphorus for optimal production. Once the seedlings have emerged or you are ready to transplant, top dress with either 5-5-5- or 10-10-10 general all-purpose fertiliser. Also, fertilise the watermelon plants in the amount of 1 & 1/2 pounds per 100 square feet of garden space. 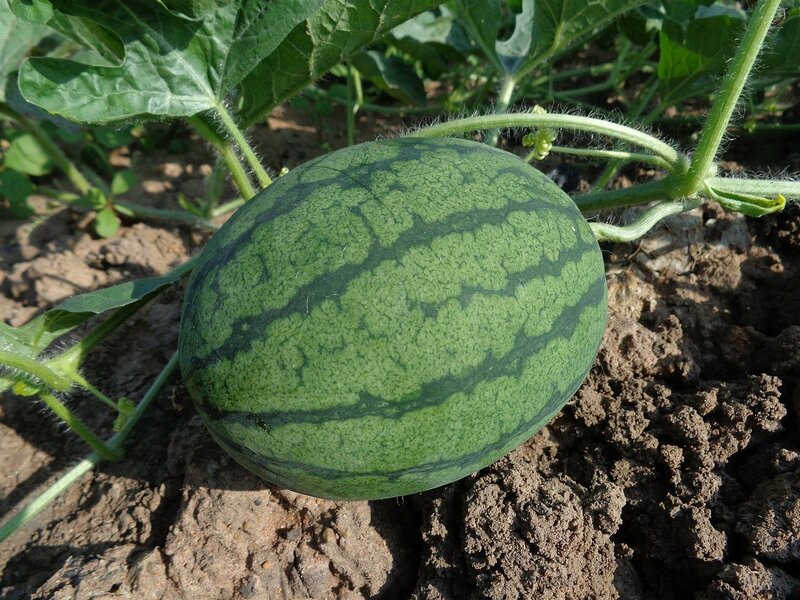 Watermelons ought to be fertilised with granular food and ensuring the fertiliser do not have contact with the leaves. The leaves are sensitive and will be smashed if not handled properly. Fertilisation ought to be done in such a manner that plant roots easily absorb the nutrients. Watermelon like any other plant is liable to diseases. One such is Fusarium wilt anthracite. When you detect this kind of challenge simply uproot and burn the affected plants. In terms of disease infestation, mildew is a fungus that affects the leaves of the plant. You can avoid this disease by preventing the leaves of the watermelon from staying wet long enough to cause mildew. Common pests of watermelon embrace aphids, mites, fruit flies, spider, whiteflies, watermelon beetles, root-knot nematodes etc. These pests have been traced to watermelon farming. In extremely hot weather, the plants are prone to diseases such as powdery mildew and mosaic virus. Upon observation of any pest, pesticides should be applied quickly and carefully so as not to disrupt growth. Watermelons are terribly thirsty plants and should be watered regularly at least once in a week until maturity, particularly throughout hot weather. You can also mulch the soil. This is important because watermelon needs adequate moisture for optimal growth. Mulch also helps to keep the weeds out. Though the crop requires watering throughout the season, a particularly important time for the process is when they are setting and growing fruit. The reason for this is that the fruit is made up of 92 per cent water. This means that the plant must take up an enormous amount of water while the fruit is developing. If water is not available to the plant at this time, the fruit will likely have stunted growth or possibly fall off the vine. It is therefore important to water the crops while they are establishing in the garden or during times of drought. You won’t be worrying about pest because watermelon is pest proof. However, it is imperative to clear the land used for cultivation and weed the farm to avoid unnecessary competition. This could help facilitate that the planted crops grow well. Also, examine the watermelon bed weekly and pull-out any weed that grows through the mulch layer by hand. Grasp weeds near the bottom or base and pull straight up, twisting slightly to dislodge deep roots without breaking them. Watermelon normally takes 85 days from planting to reach maturity. that is, ready for harvest. This does not imply that it can’t stay longer than that. However, the fact still remains that everything lies in the variety of the watermelon seed that was planted. When buying the seed, ask the seller everything you need to know about the seed. They are always more than happy to educate their customers. To know if the watermelons are ripe, either tap the watermelon to see if it sounds hallow, check the colour as a ripe melon will have a yellowish-cream coloured bottom, or observe when the vines start to wither. An unripe watermelon is whitish at the bottom. A common way, however, is to watch the tendril closest to the melon stem. The tendril is a modified leaf or stem in the shape of a slender, spiral coil. When it turns brown and dries up, the melon is ripe. The only trouble with this method is that some watermelon varieties have their tendrils drying and dropping-off more than a week before the melons become fully ripe. Also, the colour at the top is also important. When the watermelon turns ripe, there’s usually a contrast between the strips. Cut the stems with a sharp knife close to the fruit. Watermelon can last up to 10 days, however, once sliced would only last about 4 days. A fruitful watermelon farming exercise in Nigeria ends by transporting the harvested produce to the market for sale. Customers vary from fruit juice companies to fruit shops, local markets, grocery stores and pharmaceutical companies that use watermelons in their medicines when creating nutritional supplements. Sales could also be achieved with restaurants and resorts scattered across the country. Don’t forget that you can also sell directly to final consumers. That’s when you realize more than you invested. Watermelon farming in Nigeria is a lucrative and profitable business which can make anyone a millionaire in a shortest possible time. This is because of its vast market demand and your ability to build a sustainable and supply chain network. The good thing about this business is that It’s not seasonal which means you can harvest it all year round. The demand for watermelon is very high and if you’re able to begin, you’ll definitely smile to the bank. Writing a bank and investor ready professional Watermelon farming business plan can be challenging especially if you are just venturing into Agribusiness. If you need a standard and affordable business plan service, Our Professional Business Plan Writing Services is perfect for your business. I hope you this article was a valuable read. What are your thoughts on how to start lucrative watermelon farming in Nigeria, or any part of the world? Let me know by leaving a comment below.